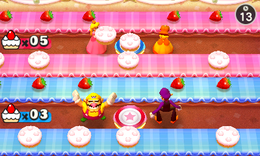 Cake Factory is a 2-vs-2 player minigame found in Mario Party 2. It is also included in the minigame compilation title, Mario Party: The Top 100. Teams have to grab ingredients from the conveyor belt and turn them into a cake. One player puts the cake on the plate first and the other player puts the strawberry on top of the cake. If the player puts both of the same ingredients on the plate or place the strawberry on the plate, the team has to do it again. If the player didn't grab the ingredient from the conveyor belt on time, the player gets stunned for a short time. The conveyor belts move a bit faster later in the game. The team who has made the most cakes wins. Game Rules – "Demand for cakes is high! One player places cakes, the other strawberries! The most productive team wins!" Game Rules (Mini-Game Coaster) – "Work as teams of two in the cake factory and crank out cakes! Make more cakes than the other team to clear the game." Advice – "If you place a strawberry first or pile 2 cakes on each other, you'll ruin that cake and have to start again!" Description – "Work as a pair and top cakes with strawberries to finish them!" On-screen – "Pair up to make lots of cakes!" This page was last edited on August 4, 2018, at 09:59.